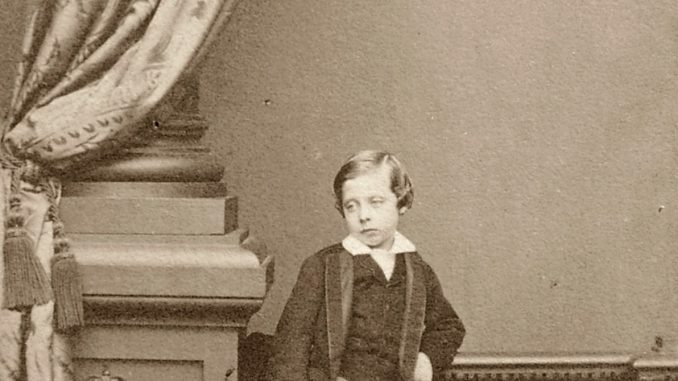 Prince Leopold was born on 7 April 1853 as the eighth child and youngest son of Queen Victoria and Prince Albert. Queen Victoria used chloroform during his birth, and her doctor later wrote, “I commenced to give a little chloroform with each pain, by pouring about 15 minims by measure upon a folded handkerchief.” Victoria was quick to give the pain relief her blessing. It was Victoria’s mother, the Duchess of Kent who first noticed there might be something wrong and she wrote the following day, “The poor thing appeared to be delicate, which made me anxious.” Three days after his birth, he began having problems with his digestion. Victoria remained optimistic, but even she could not ignore the piercings screams. Worries lessened somewhat with a new wet-nurse, and Leopold slept better. Young Leopold was christened on 28 June, and his godparents were: King George V of Hanover, Augusta of Saxe-Weimar-Eisenach, Princess Mary Adelaide of Cambridge and Prince Ernst of Hohenlohe-Langenburg. Though many cases of haemophilia were discovered in infancy, it appeared that Leopold’s condition took quite some time to detect. Nevertheless, he was slow to speak, and his teeth came slowly, but he was intelligent. His first recorded attack of bleeding took place in 1855. He had taken a bad fall and was still in bed six days later. An accident in 1856 left him with a badly bruised face. The following year, he was lame for several days after a fall and concerns were raised. Victoria first mentioned a “defect” in a letter to the King of the Belgians on 2 August 1859 – there had clearly been a diagnosis though it is unknown if they were aware of the hereditary aspect. Victoria wrote, “Your poor little namesake is again laid up with a bad knee from a fall – which appeared to be of no consequence. It is very sad for the poor Child – for really I fear he will never be able to enter any active service. This unfortunate defect… is often not outgrown & no remedy or medicine does it any good.” He continued to have accidents and resorted to wearing a knee-pad. Leopold often had to be carried, and he also suffered from regular nosebleeds. Nevertheless, he outgrew the nursery and took up lessons. His overall health remained weak, and it was advised that he should spend the winters in a warmer climate and an appropriate chaperone was found for the young boy, and he left in early November for France. He later told his sister Louise after she married, “When I stood on the steps watching you go, I could not but remember when I myself said goodbye to dear Papa on those very steps, nine years, ago, & never saw him again & it added greatly to my sorrow.” Prince Albert died on 14 December 1861, having dictated a final letter to Leopold, “My dear Leopold, although very unwell, with general depression and therefore not able to hold a pen myself, I dictate this to Alice, to thank you for your dear little letter. I am glad you like your games at croquet and have such beautiful weather. Here it is cold, damp and detestable… I trust you had your pocket money, which I have fixed at two napnn (?) a month. Goodbye dear boy, Ever, Your affectionate Papa.” Leopold would not return home until early April. In 1862, as the family was travelling to Coburg, Leopold accidentally pierced the roof of his mouth with a steel pen, and the bleeding could not be controlled. Victoria was greatly distressed and wrote to the Princess Royal, “He has not lost near as much blood as frequently before – but the fear was – the bleeding could not be stopped, and then you know he could not have lived.” Luckily, a Berlin surgeon found a treatment that stopped the bleeding. Victoria attached herself to Leopold after this, and she would have him by her side as much as possible. After internal bleeding shortly after his tenth birthday, he was forbidden from riding horses. In 1863, Leopold acquired a dachshund he named Waldmann or Waldi, and it became his constant companion. Nevertheless, he was often forgotten by his elder siblings, and he was lonely. Then he began having fits. In January 1868, he once again had a very serious crisis, and it was expected that he would die. Queen Victoria later wrote, “I felt that henceforth this dear child, who as it were, has been given back to me from the brink of the grave, must be my chief object in life.” The following summer, he and his mother travelled to Switzerland. The following year, Leopold was confirmed at Whippingham Church on the Isle of Wight, but it would prove to be an awful year – healthwise. At Christmas, he was still bedridden and in 1870, he once again had troubles with his knee. He wrote, “I am altogether very low about myself, as no sooner had I recovered from my last tedious illness & no sooner was I able to get about again than here I am laid up again.” He could only distract himself with music, letters and books. Shortly after his 18th birthday, Leopold was to go to Oxford. Victoria did not want to let him go, and he was only allowed to go under certain conditions and regulations. 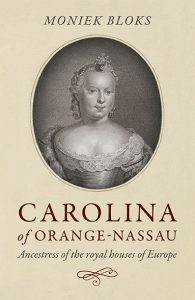 He thoroughly enjoyed his time there, and Oxford and Victoria was pleased to find him “not changed in the wrong direction but in the right.” Nevertheless, she kept a watchful eye on him, and everything was reported back to her – to Leopold’s frustration. By 1873, Leopold was in love but alas we do not know who the woman was – her name may have been Alice Liddell. He had hoped to marry her, but all talk of marriage ended in the autumn of 1873. The relationship between him and his mother hit a new low. I don’t know if it’s even slightly likely but is his unknown pocket money possibly hapnn rather than napnn and, therefore, some abbreviation of ha’penny, or halfpenny? Just a thought.